[New for 2015] It's been awhile since we've reviewed one of the little Friendly's sundae cups, and technically Nick hoped to find it first, but I found it but that's ok because I think technically I'm a bigger fan of strawberry flavors anyway. HA! Doesn't that just scream #FunFactor? I think so. Plenty of two tone cake bits, it smells good, and well, if experience has taught me anything, it's that you need to let these things warm up a bit before digging in (aka I had plenty of time to type out that giant description a moment ago). 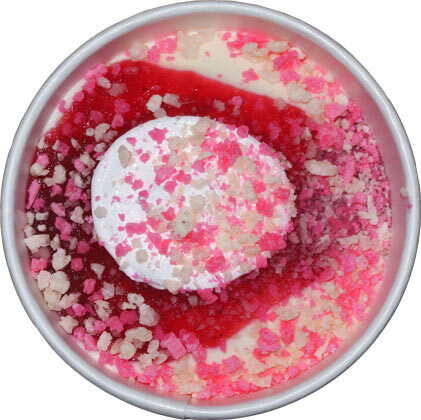 Well, there's all the layers (and a giant puddle of strawberry sauce). If I wanted to nitpick, I'd say the vanilla seems a little off, but come on, just scoop through all the layers and get a nice mix of everything. It's taking the strawberry sauce awhile to get unfrozen, but I like the flavor. It's nice and sweet without too much bite. The crunchies are probably the biggest fun factor. You just don't see them used much, or at all really. I can't help but wonder why there isn't a strawberry ice cream cake on the market in my area.... oh, technically Carvel has the "love & laughter" cake but I think it's supposed to be a Valentine's thing (which I will be looking for next year). Ok, that's it, I'm done already. Overall a fun little treat, I can't complain really. Sure the ingredient list is kind of crazy long, but we do have a lot of stuff going on in this tiny little six fluid ounce cup. It's definitely worth a try especially if you find it on sale for a dollar. Well at least when they put it in a cup you can't tell it's a blatant rip off of a Good Humor Strawberry Shortcake bar. 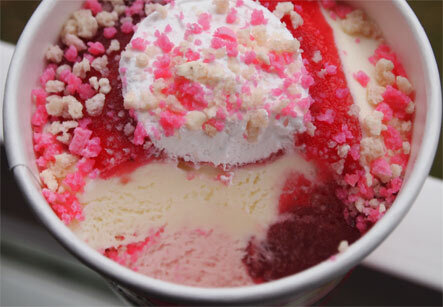 I have personal gripes with Friendly's as a brand / franchise that deter me from trying any of their ice cream. I've had to stop going to their restaurants in general because their staff is anything but friendly, and the service is always terrible. TTB: out of curiosity, have you been back since the massive overhaul of their restaurant structure? They closed a ton of stores and basically ditched their painfully awful food menu in favor of something more modern (and supposedly enjoyable). I haven't been back in awhile but that's more so because of the like 9 stores I had access too, only one of them is still open.... that's not true, 3 are still open, but you get the idea. 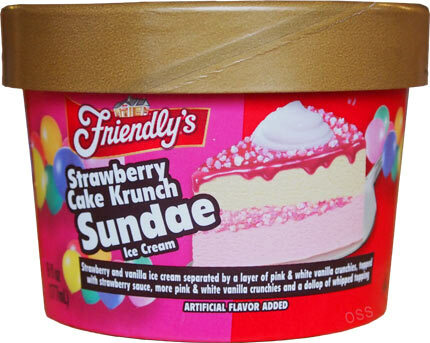 Why, oh why, can't we get Friendly's in the South! This ice cream looks delish. I just found and ate this one tonight Dubba and LOVED it! Blue Bunny used to make a strawberry champ cone that got discontinued a few years back and I've been trying to fill the void ever since. Thanks for the heads up! Blue Bunny calls their version of this Sundae Crunch, which I believe they still make in bar form. The strawberry cone version my be discontinued.